Can you survive their relentless onslaught? Can you press deeper into their lair to find the evil villain that drives them forward? There are only two ways for your quest to end—in death or in glory! NOTE: Early in 2017, FFG and Games Workshop decided to end their licensing agreement; as such, while the rules are still available, there is no longer a page for this game on the FFG site. 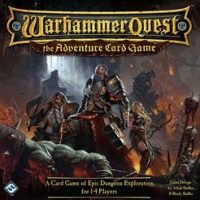 Add a Review for "Warhammer Quest: The Adventure Card Game"